Hank, W2LOP, fuels up the Morris Township OEM (Office of Emergency Management) Heavy Rescue vehicle "602". 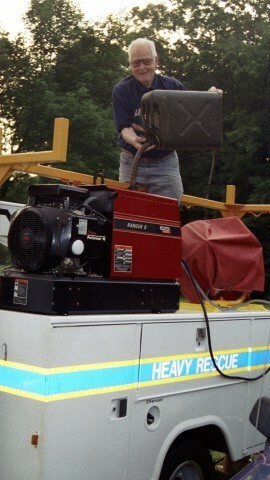 The Township OEM was kind enough to lend the vehilce for power. Ham radio operators are part of the local OEM infrastructure, providing communications during emergencies through RACES (Radio Amateur Civil Emergency Services).